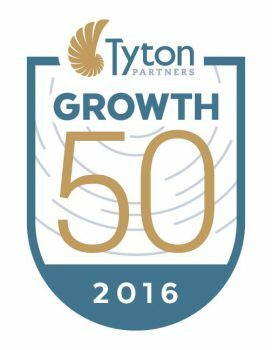 WASHINGTON, D.C., September 8, 2016 – Interfolio, the pioneer in faculty-first higher education technology, has been recognized as a 2016 Tyton Growth50 company. The Tyton Growth50 celebrates innovative organizations achieving impact at scale through a combination of strong financial performance; market awareness and adoption; and demonstrated customer outcomes across the preK–12, postsecondary, corporate training, and consumer education markets. As one of 50 organizations selected this year, this achievement marks a significant milestone in Interfolio’s evolution. Each year, experts on the Tyton Partners team review nominated companies in the space, evaluating each against the Tyton Growth Framework to narrow the field. That analysis is used to select the 50 companies that best exemplify the impact, engagement, awareness and sustainability necessary to have lasting impact. Interfolio is on a mission to create inspired user-centric products focused on the ecosystem of faculty work, decisions, and data in higher education. ByCommittee™ is the first administrative enterprise SaaS solution to facilitate academic decision support for faculty committees and provide an engine for intelligent decision making in higher education. Visit www.interfolio.com to learn more. Tyton Partners is the leading provider of investment banking and strategy consulting services to the global knowledge sector. The firm has offices in Boston and Stamford (CT), and an experienced team of bankers and consultants who deliver a unique spectrum of services from mergers and acquisitions and capital markets access to strategy and market development services that helps companies, organizations, and investors navigate the complexities of the education, media, and information markets. Tyton Partners leverages a deep foundation of transactional and advisory experience and unparalleled level of global relationships to make its clients’ aspirations a reality and catalyze innovation in the sector. For more information visit www.tytonpartners.com or follow us @tytonpartners. We want to work with you! Check out our latest job openings.